Sponsored content by Gracious Garlands. I’m so excited to talk with you today about one of my favorite topics – decorating for the holidays! I realize that as Hospitality Director for the Austin Trial of Lights, decorating for the holidays is what I do practically all year round, but it seriously never gets old! Along with my top 5 ways to “spruce up” your holiday décor, today I’m sharing with you one of my new secret weapons for my own home’s holiday decorations. My favorite and easiest way to decorate in any season is to bring the outdoors in. That means that for the holidays I love “sprucing up” my home with pine and spruce branches in tablescapes, garlands and, of course, I can’t forget my Christmas Tree! However, during the holidays I’m so busy creating memorable parties and experiences for the Austin Trail of Lights that, to my family’s dismay, my own home’s holiday decorations are the last things on my list! Enter Vicki and Eleanor Worsham of Gracious Garlands. This mother-daughter duo curate the freshest and most beautiful greenery from farmers around the country specially designed for your holiday decorating. Not only do these ladies kill it with their gorgeous greenery, but their company mission is so honest and heartwarming. They are dedicated to their business’ communities and give back with their partnership with Magdalene House Austin. As I mentioned, I love decorating with natural elements for the holidays. Incorporating greenery, berries and even fruits and vegetables into showpieces create a sense of warmth, comfort and a homey feeling. 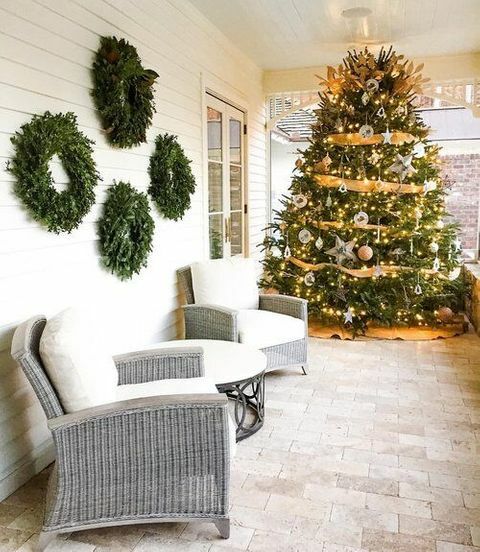 Below I’ll show you how the ladies at Gracious Garlands have read my mind by offering ready-made solutions for each of my top 5 ways to add some spruce to your holiday décor. Holiday door wreaths are the perfect way to offer a cheery welcome or home-coming to your holiday guests. This, along with some beautifully shining lights, is your first impression to your guests, so let’s make it a great one! 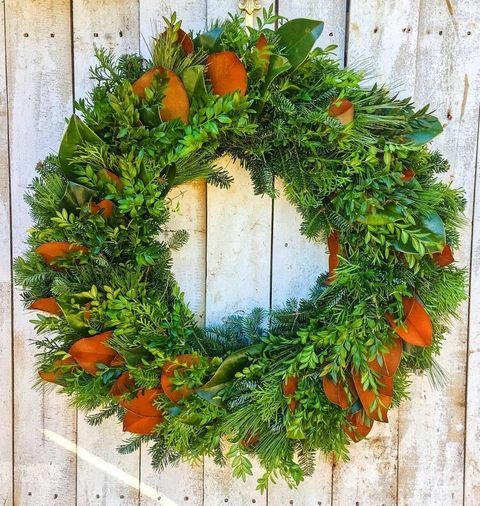 I love the simplicity of the Ultimate Holiday Mix Wreath by Gracious Garlands with the mix of fir, pine, boxwood and magnolia leaves creating simple and interesting textures. Add a bow or keep it clean for a fresh look that also smells pretty amazing! Similar to your holiday door wreath, sprucing up your mailbox at the street is a surprising and unique way to welcome those heading from the street to your front door. Not to mention, a perfect way to spread a bit of holiday cheer to your neighborhood postman or woman! 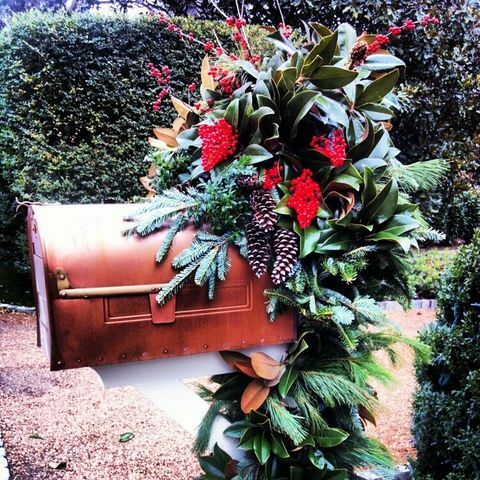 This Custom Mailbox swag from Gracious Garlands is unlike anything I’ve seen before with the lux incorporations of pine cones and winter berries. If you want your house to stand out on the block, swag your mailbox! What is more classic holiday décor than green garland placed on the mantel or draped over your doorway? I’ll admit, sometime I too get tired of the same Fraser Fir garland everywhere, but Gracious Garlands keeps surprising me with their 7 different options of garlands. Go classic or mix it up with the Magnolia Garland or the Ultimate Holiday Mix Garland (my holiday pick). 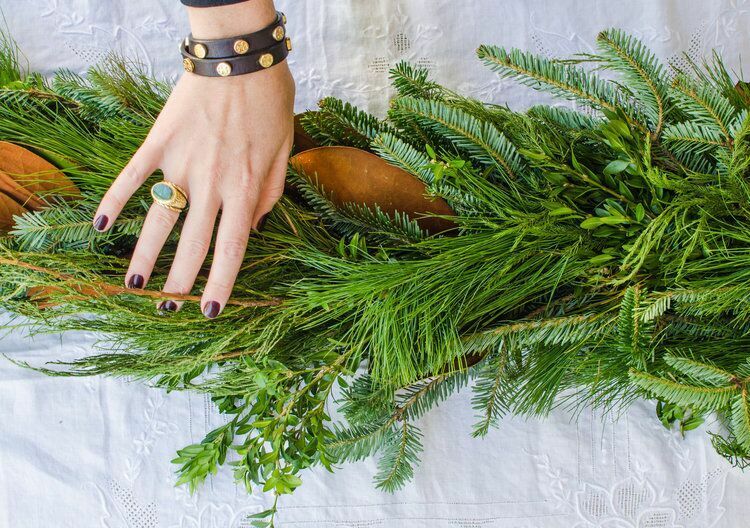 Your friends and family will be so impressed with these lush ropes of holiday greenery… and you didn’t lift a finger! My Trail of Lights family knows I LOVE tablescapes! They are honestly my favorite piece of décor for the holidays. When friends and family gather a table with a beautiful centerpiece, that’s when it really feels like the holidays. However, because come Christmas Day I’ll barely have the energy to pull myself out of my cozy sheets, I’m counting on Vicki and Eleanor to save my holiday table! 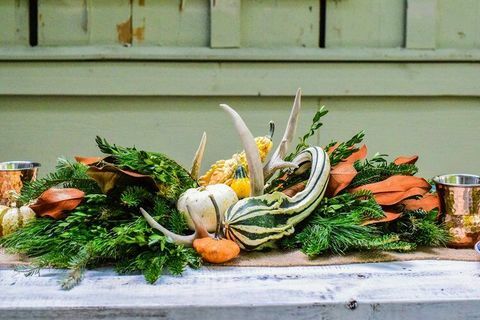 I love the way their Table Centerpieces incorporate antlers, unique baby pumpkins and other gourds to create show-stopping color and texture that makes the table just as interesting as the company. 1. Pies de resistance - Christmas tree! You knew I couldn’t forget the show-stopper of all holiday show-stoppers, the Christmas Tree! And yes! Gracious Garlands will be helping me there too. While shopping for trees used to be a family holiday tradition, with my kids now grown up or nearly, everyone is so busy that finding time to search for the perfect tree becomes too much for us. I know that I can count on Gracious Garlands to deliver me a fresh and lush Premium Christmas Tree and even help to set it up. I hope the 5 ideas have helped you “spruce up” your holiday décor. And for anyone who is as busy as I am during the holiday season, I sincerely encourage you to get a jump on your holiday decorating with Gracious Garlands this year in Austin. It’s so easy… After you place your order, you’ll receive your greenery the week after Thanksgiving – via client pick up at a central location or with doorstep delivery. But don’t wait because their online order deadline is coming up soon – Friday, October 27, 2017! 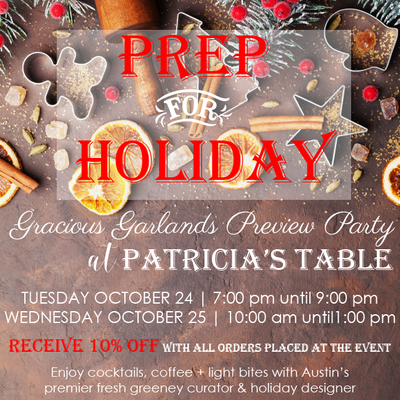 Don’t miss your chance to meet the fantastic ladies of Gracious Garlands at their Holiday Party on Tuesday, October 24, 7-9pm and Wednesday, October 25, 10am–1pm at Patricia’s Table in Austin. Attendees will receive 10% off all orders placed at the event.